Hugo: That’s how you know it’s an adventure. Before any image even appears on screen, master filmmaker, Martin Scorsese, sets his scene with the sounds of his central character, Hugo Cabret’s life. Clocks are ticking, gears are clicking and trains are passing. These are the sounds one knows well when one lives behind the faces of clocks in a grand Parisian railway station. Once Scorsese shows us the images to match his intriguing soundscape, there is no escape. You are instantly taken on a 3-Dimensional journey that floats high above the snow-filled Paris sky and swoops seamlessly into the busy station. The magical ride that is Scorsese’s HUGO has begun and you won’t want to get off. 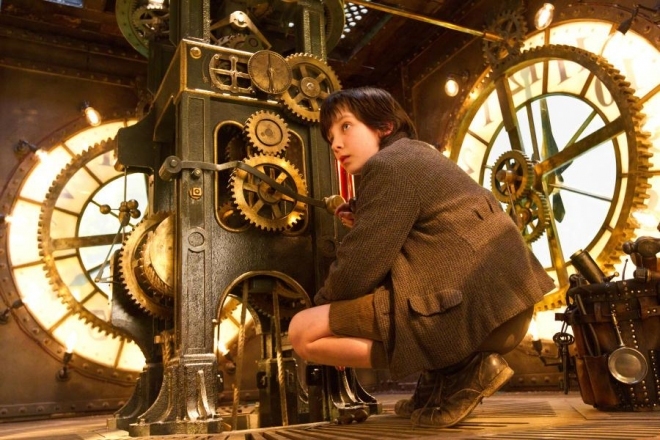 As Hugo, played by the talented young actor, Asa Butterfield, darts in and around clock gears and busy crowds, it is immediately clear that HUGO features some of the best, if not the best, 3D work to emerge from its current renaissance. In the hands of a skilled and dynamic filmmaker like Scorsese, the levels of depth added to the screen are dazzling. It certainly helps that Hugo’s journey, based on the Brian Selznick picture book, and the setting in which it takes place, are so rich and colorful to begin with. The train station where Hugo lives is populated not only with travelers but quirky, if not somewhat cliched, characters, and his unintentional interaction with them leads him on an adventure he hopes will heal his tormented past. It isn’t long before Hugo soon learns that he’s not the only one whose past haunts him. While Scorsese’s intuition as a filmmaker lends itself incredibly well to the 3D format, his ability to tell a focused story is somewhat lacking here. Famous for hard hitting gangster films and tortured characters, his first foray into family filmmaking is certainly exciting but somewhat misguided. At times, it isn’t clear whose story he is actually telling. 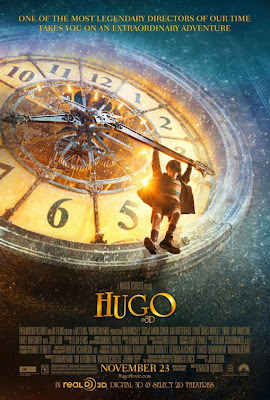 Is HUGO about a boy, orphaned after the recent loss of his father (Jude Law), struggling to find a way to move on, or is it a love letter to the great film masters of the past? Scorsese plays homage to film history throughout HUGO and, in doing so, he accomplishes two things. For one, he honours his influences with great style while bravely bringing film itself forward with his own commendable technique. The unfortunate offshoot though is that he seems to distract himself from the story at hand with his own visual prowess.